Wait, that's not right. Don't turn it Loose! 'cuz it's a mother. This month, I had a poster to do with a friend. This month we lost a star(man). There was only going to be one outcome. We raided Davey Jones' Locker and pull out what we could, we made a David of all David's. 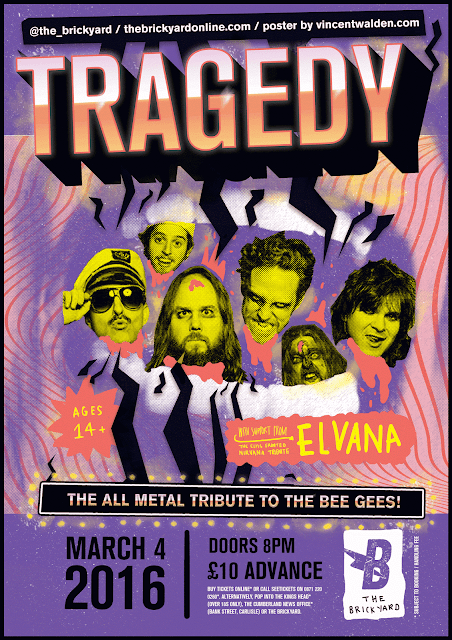 Do you remember that time an all metal tribute to the Bee Gees brought an Elvis fronted Nirvana band to the very north of England? Me neither because it sounds bloody mental. As mental as it sounds, that exactly what is happening and it's bloody well happened before. I have successfully raided all of the filters photoshop has to offer, exploited every colour that I could find in a similar shade to pink and splashed it all with some bright, obnoxious yellow. I really don't know what the idea for this was. It's behead member of the band, inside a screaming mouth in all shades of pink, purple and yellow. The best bit about this poster is it's ugly. It's nice to make something pretty and solid, but mad, ugly and bright is just so fun to make.